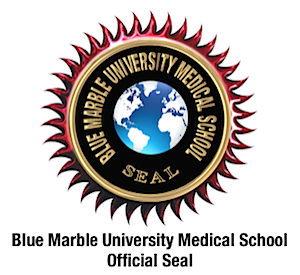 Blue Marble University School of Medicine offers the only online MD degree that can be completed in three years, totally online. It is an exciting, unique program that trains the student in the medical arts and medical sciences for application in non-clinical careers. We offer two online programs: our regular 3 year online Doctor of Medicine (MD) degree; and our fast-track 5 year combination Bachelors/M.D. degree which can be entered right from high school. Please click on the Curriculum Tab above to view these programs in more detail. Our Doctor of Medicine is a rigorous program adapted from various international medical schools, and follows the new 3 year time line developed by several USA medical schools. As a distance learning Doctor of Medicine degree program, we necessarily omit all clinical rotations and hands-on patient contact, but we retain studies of clinical medical texts. The goal of the program is to not only teach the practice of medicine, but also to teach what are some of the related components of the health care industry: Stem Cell Therapy, Clinical Trials, Medical Devices, and Hospital Management, just to name a few. Internationally, the MD degree is a professional doctorate degree, and in much of Europe, the M.D. is considered to be a research degree similar to a Ph.D., being awarded upon submission of a thesis in the field of clinical medicine. For example, at the University of Leicester College of Medicine (United Kingdom), “the MD Degree is a postgraduate research degree awarded for original research carried out in a clinical or health-care related context”. In the USA, the MD degree is awarded after usually 4 years of medical education, although 3 year programs are now developing. Following the receipt of the MD degree, those students that wish to practice medicine must complete one year of internship, pass the US Medical Licensing Exam, and complete additional training in most cases. Some USA students opt to forego the additional internship and licensing procedures, and use their MD degree in other careers. 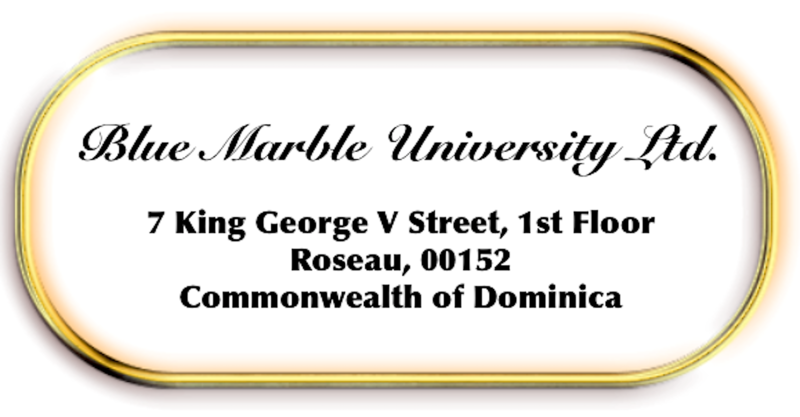 Notice: The MD degree issued by Blue Marble University can never be used for physician licensing purposes, to satisfy any education requirements for licensing as a physician or other licensed health care provider, or for any work involving direct patient care. In the USA and most countries, it is illegal to hold oneself out as a licensed physician unless one is in fact licensed. When we say you cannot use our MD degree in clinical practice, we do not mean you are barred from working in a clinical setting. But in the clinical setting you are barred from using the “MD” designation or “Doctor”. Of course, your name tag could be “Medical Professional” or anything else assigned to you by the clinic, hospital, or institution. The whole idea is that patients are not misled into believing you are a licensed physician or a doctor. For any non-clinical setting you can always have a business card with M.D. and advertise yourself as “Doctor” or “MD”, so long as the target audience are people other than patients. You can even operate your own clinic, so long as you have licensed physicians or physician assistants associated with a licensed physician. And there are numerous and fulfilling non-clinical careers for persons with an MD degree. 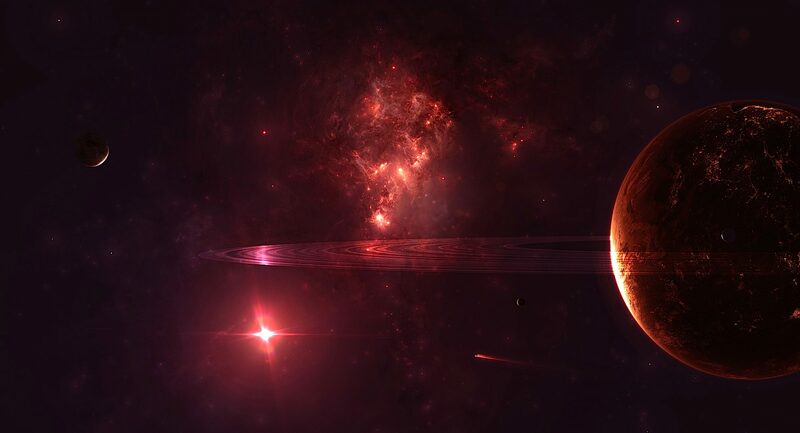 Similar to many California Law Schools which offer an Executive JD degree which cannot be used to become a licensed attorney, we offer what is essentially an executive MD degree for use in medical consulting, medical writing, Affordable Care Act (ObamaCare) administration, medical research, health care management and development, as well as many other careers as summarized below. Many people don’t know that there are many MD’s who completed their coursework, obtained their degrees, but did not complete their clinical training, yet work in a myriad of nonclinical careers. 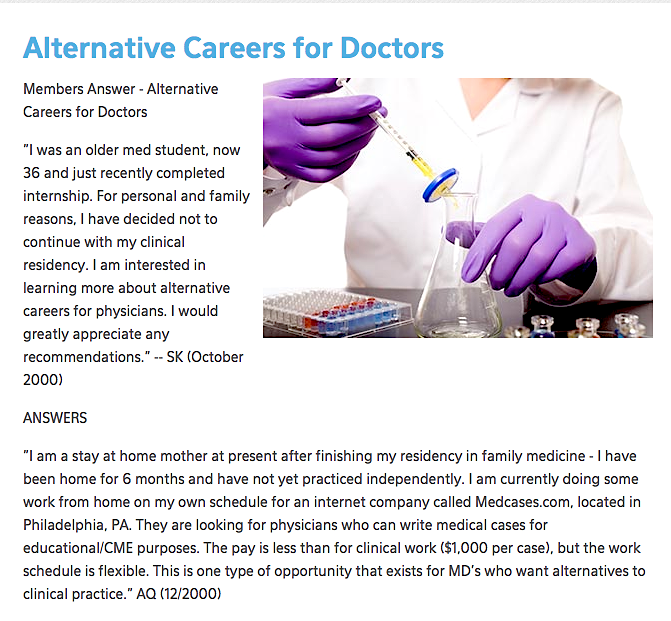 And see the following List of Careers for MD’s that are not licensed physicians, from Joseph Kim, MD, MPH, who operates the websites www.medicineandtechnology.com and www.nonclinicaljobs.com where you can find valuable information on non-clinical careers for MD’s. So don’t think of an MD degree from Blue Marble as leading to being an “unlicensed physician”, but rather as someone who is an Executive MD, Medical Scientist, or Medical Administrator. We teach you the “language of medicine”, and in order to understand and effectively use the language, you have to be trained in the medical arts. That is what our online M.D. Degree is all about.